PKSF established AU as its mainstream program in June 2013. The purpose of this unit is to extend sustainable agricultural technology and capacity building supports to the door-steps of farmers with a view to increasing farming productivity and ensuring food security of the country. This Unit enables the farmer to gain access to resources necessary for boosting crop production. Accordingly, AU has designed its work plan and implementation strategy for crops sub-sector. Being an integral part of PKSF, `Agriculture Unit’ has been working within the purview of financial and administrative capacity of PKSF as a supplementary and additional service provider of the Government. Enhancing knowledge, skills and awareness of farmers as well as staffs of POs through training, exposure visit, motivation etc. Conducting field days for effective dissemination of technology related information and effective crop production techniques. Operating `Agriculture Counselling Center’ for instant solution of field level crop related problem faced by farmers. Agriculture Unit of PKSF has already completed the 5th year of its execution successfully, marked by enthusiasm among farmers and POs. For the fiscal year 2018-19, PKSF has allocated BDT 8.50 crore for AU activities in 31 POs working in 55 Upazilas of 25 District covering 25 Agro-ecological Zone (AEZ) of Bangladesh. Since its inception a total of 15,946 demonstrations have been established on different agricultural technologies. These demonstrations include ‘summer watermelon production’, ‘summer tomato production’ ‘vegetable seedling production on plastic tray using co-codust’, ‘natural vegetable/potato storage’, ‘fruit bagging technology’, ‘safe crop production by following ICM & GAP’’ etc. up to June 2018. Besides, 876 field days have been arranged in order to disseminate the positive results of demonstrated technology to large number of farmers. AU has also provided 687 USG applicators and 54,731 pheromone lures (for pheromone trap) to the farmers, install 8280 perching stick in 276 acreas of rice field and provided 287 households with vegetable seed up to June 2018. For learning and sharing of the best practices of crop cultivation 05 exposure visits have been arranged. About 201 Upazilla Planning Meetings and 1803 ‘Agriculture Counselling meetings have also been arranged under AU. During FY 2018-19, a total of 1199 demonstrations have been established on different agricultural technologies; provided 230 households with vegetable seed, install 6500 perching stick in 216 acreas of rice field and 2,788 pheromone lures up to 20 october 2018. Besides, 19 Upazilla Planning Meeting and 42 ‘Agriculture Counselling meetings have also been arranged during current FY. For effective expansion of new technologies a total of 24,925members were trained on crop production. These training were conducted with the help of central and local level resource persons from Department of Agricultural Extension (DAE), Bangladesh Agriculture Research Institute (BARI), Bangladesh Rice Research Institute (BRRI), Bangladesh Agriculture Development Corporation (BADC) etc. About 285 members were also trained on specialized farming activities at RDA, Bogra & PO training centers of various districts. AU also trained 579 agriculture officers of POs on different improved technology at Rural Development Academy (RDA), Bogra and Bangladesh Agriculture Research Institution (BARI) respectively. During Fiscal year 2018-19, AU has trained 53 agriculture officers of POs on ‘Vegetable Seedling Production on Plastic Tray using Co-codust’ at PO training center. A total of 44 batches (for 1100members) of local level training has been arranged on crop production in line with the implemented technology up to 20 October 2018. 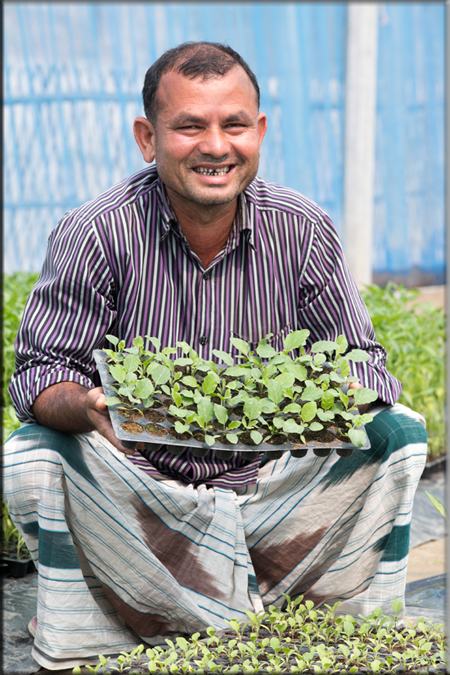 In FY 2017-18, AU has launched ‘Alternative Crop Production and Generating Multiple IGA Instead of Tobacco’’ in predominantly tobacco growing area, Mirpur Upazilla of Kushtia. Initially selected farmers have spared 33 acreas of tobacco land for food crop production. They are also being involved in rearing beef cattle, commercial poultry, black Bengal goat, turkey for additional income. Preliminary results are encouraging; targeted farmers started realizing the benefit (financial, health, environmental and educational of the households) of food crops production over that of the tobacco. During current fiscal year, this activities has been expanded to Lalmonirhat, Coxbazar and Bandorban, another three predominantly tobacco growing districts of Bangladesh. AU has taken an initiative for expanding climate smart agriculture through floriculture, spices, fruits, oil seed crops, special nutrient enriched crops and high value crops cultivation at different Agro Ecological Zones (AEZs) of Bangladesh. 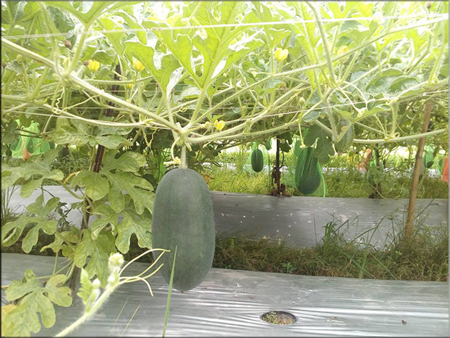 A number ofdemonstrations are being established on summer water melon, cherry tomato, capsicum, niger, coriander, marigold, sunflower, gladiolus, chrysanthemum, snowball, broccoli and short duration mustard at field level. Vegetable cultivation on the edge of cultivable land is another dimension of activities within the purview of this Unit. AU is also involved with the expansion of ‘Bagging Technology’ for safe fruits and vegetables production. Besides, Results Based Monitoring (RBM) has been conducted to evaluate the activities undertaken under this Unit. To continue the dissemination of knowledge and technical services among the farmers, this Unit has been provided some agricultural technologies, technical training and advisory services by linking with different research, educational, and extension organisations since it’s inception. It’s a great success of this Unit that, a good number of expanded technology such as summer tomato production, pheromone trap to cultivate safe vegetables & fruits, urea saving technology urea super granules (USG) for rice & vegetables production, quality rice seed production technology, homestead gardening etc is being replicated by farmer itself at field level.